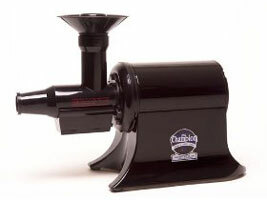 The Champion Juicer is one of the most established brands of masticating juicer on the market. It is also one of the most well respected juicers in the nutritional health world. Masticating juicers are reported to withhold more nutrients and goodness in the juice drink then any other type of juicer. It is also one of the most expensive juicers on the market, so is it worth its high price tag? This is without a doubt a professional juicing machine and it is advertised as suitable for commercial use. That’s not surprising as it has an incredibly powerful motor that is capable of juicing large amounts of fresh fruit and vegetables. Its large feeding chamber allows big chunks of vegetables and fruit to be passed into the juicer. Although it doesn’t allow you to juice whole fruits it really doesn’t require that much extra preparation time to chop them up. Masticating juicers have been reported by health experts to offer the most nutritional benefits from your fruit and vegetables. The time it takes is slightly longer than a centrifugal juicer but this is so insignificant and the health benefits are simply more important. The Champion juicer may not win any awards for it’s looks but let’s face it what you are looking for is the most efficient juicer and it is certainly that. Because of its size and weight you have the peace of mind that you are not going to easily break it and you know it won’t wobble around your worktop. However make a space for it on the work top as it’s rather heavy to drag out the cupboard every time you want to use it, and you will want to use it every day. The Champion 2000+ is made from long lasting stainless steel, which is resistant to staining and food odour. Personally I prefer the black model as white coloured goods often get a little bit dirty looking in our kitchen. As with any juicer easy cleaning is essential, everyone that loves juicing wants to juice regularly and you don’t want to be put off by the cleaning. The Champion juicer couldn’t be simpler to clean although you can’t put the parts in the dishwasher. It is also so straightforward and simple to use, once you’ve done it a few times you’ll be away, juicing like a professional. You do have to find a suitably wide low jug to catch the juice in, as unfortunately one is not supplied with the juicer. It is also not just a juicer you can use the other Champion 2000+ attachments to make baby food, sauces, nut butter and ice cream. The only thing I can think of that it doesn’t do is juice wheat grass. Now about the price, yes it’s a lot of money, especially for just a kitchen appliance, however by buying the champion juicer you may just save yourself some money. Many people have been using their Champion juicer for years and years. Lets face it, it comes with a ten year warranty so the manufactures are pretty confident it’s going to be with you for a major part of your life time. Many people have been reluctant to part with the large sum of money when you can buy other models cheaper, but to their peril they’ve found this to be a false economy. Cheaper juicers can be less reliable, harder to work, more difficult to clean or just not up to the job and end up in the bin or at the car boot sale. If you can save up and invest in the best it will save you money in the long run. As the Champion juicer is such a long lasting heavy duty professional masticating juicer, that is easy to clean and produces wonderful juice with easy and efficiency. It’s no surprise that it gets my five star rating without any hesitation.